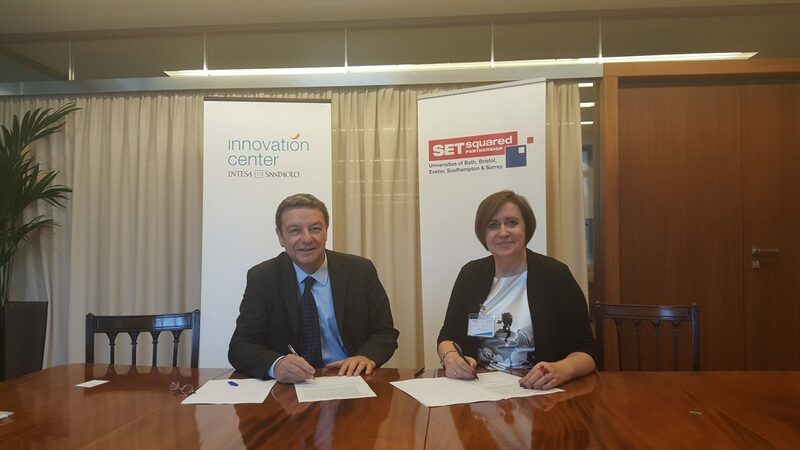 SETsquared, the global number one university business incubator, signed a collaboration agreement with prominent Italian bank Intesa Sanpaolo. The agreement, which was signed at Intesa’s new Innovation Centre in London, will see SETsquared support the pioneering banking group by introducing it to new high-tech companies and nurturing its internal culture of innovation through a series of entrepreneurship bootcamp events. SETsquared works with over 250 high-tech start-ups, and the partnership will add value to clients and customers on both sides of the collaboration. For example, it will broaden the range of international corporates that SETsquared start-ups have access to for help with securing investment or adapting their technology for use by corporates.